When all required sections of the Installation Summary screen have been completed, the admonition at the bottom of the menu screen disappears and the Begin Installation button becomes available. Up to this point in the installation process, no lasting changes have been made on your computer. 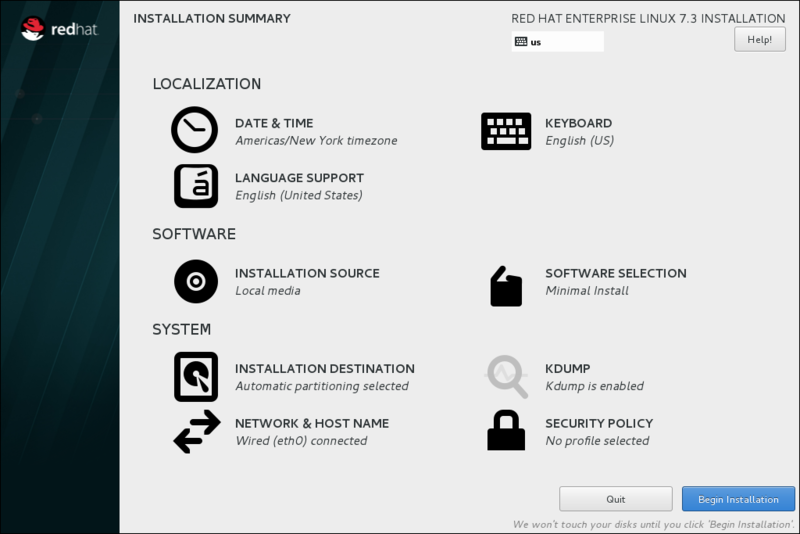 When you click Begin Installation, the installation program will allocate space on your hard drive and start to transfer Red Hat Enterprise Linux into this space. Depending on the partitioning option that you chose, this process might include erasing data that already exists on your computer. To revise any of the choices that you made up to this point, return to the relevant section of the Installation Summary screen. To cancel installation completely, click Quit or switch off your computer. To switch off most computers at this stage, press the power button and hold it down for a few seconds. If you have finished customizing your installation and are certain that you want to proceed, click Begin Installation. After you click Begin Installation, allow the installation process to complete. If the process is interrupted, for example, by you switching off or resetting the computer, or by a power outage, you will probably not be able to use your computer until you restart and complete the Red Hat Enterprise Linux installation process, or install a different operating system.